Motorola, a phone company that recently got bought by Google, is releasing a new technological development that is quite odd. Motorola has decided that the current ways we have to unlock our phones are boring, they have said "no" to generic face, thumb, pattern, and code unlock methods and have decide that we need a temporary tattoo that will unlock your phone. Now you might be thinking what do I mean, well below is a short video to show off exactly what I am on about. How does this work? If you look past the curly design of the tattoo it actually has a ultra-thin NFC circuit and is wrapped in a medical grade 3M adhesive that shouldn't cause your skin any harm. It will last up to 5 days of showering, swimming and all other types of leisure and work activities. The tattoo itself is only the size of a nickel and supposedly blends on your wrist, and has a vortex design. Couldn't someone just have a tattoo themselves and gain access to my phone? No, you setup the tattoo by pairing it with your phone, meaning not just anyone with a tattoo can unlock your phone. If someone steals one of your tattoos, you can quickly un-pair it through the device. 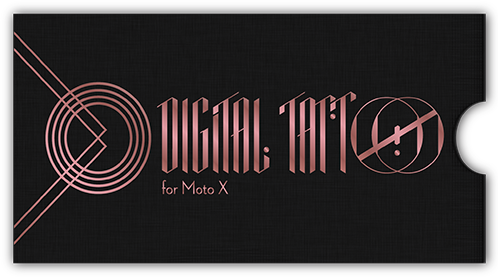 Motorola hopes that this is a start for wearable technology and have also stated they are working on some designs to make more tattoo's so you can have a pick at what you want it to look like. The question is will anyone really use this? Do you see yourself wanting this on your phone or is it just another gimmick that you will use or a short period then go back to the classic old code unlock? Has Motorola found a new technology that will set them ahead, or will Google allow this technology to go to other Android companies?